The preference panel is made of 3 parts. General, Advanced and Rules. Bandwidth: Lets you select how much bandwidth to allocate to eMail Verifier during testing. It is a percentage scale of available system bandwidth from 10 to 100% in steps of 25%. It is recommended to use the default 100% default setting in order to get best performances. Threads: Set how many simultaneous connections have to be used during testing. By default eMail Verifier uses 10 threads. Note that using 1 only thread will make the verifying process 10 times slower. Timeout: Time in seconds a connection will stay alive waiting for a response. Default setting is 15 seconds. You are free to increment that value up to 1 minute if you feel connections are being performed very slowly. Retries: Set how many times a connection will be attempted before giving-up. By default eMail Verifier will make 3 attempts. DNS Server: Select if you prefer to use system default DNS server or a given custom address. You can also use a second address and balance domain lookups between them. MX Lookup: Depending on your operating system, MX lookup may be done either as 'Internal' or using 'Dig' on Mac OS X or 'nslookup' on Windows. - On Lookup mark address as: Select how eMail Verifier should mark an address on lookup failure. - Use Mail Exchanger with highest priority only: Force eMail Verifier to use highest priority exchanger only. 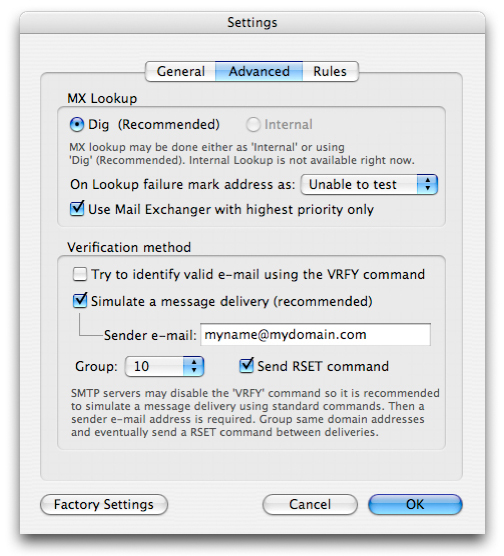 Verification method: SMTP servers sometimes disable the 'VRFY' command. In those cases it is recommended to simulate an email delivery through standard 'MAIL FROM' and 'RCPT TO' commands. Then a sender email address is required. Please note that this email address must belong to a valid domain as it will be used in some SMTP command. The 'Group' option limits the number of email addresses to be tested per session. You can also set eMail Verifier to perform a RSET command (Reset) between sessions. For some addresses, such as AOL, Yahoo, and other non-SMTP mail, you can't verify whether the address is good or not. You won't know definitively until some bounce. The mail server won't cooperate. In fact, a few ISP's mail servers are configured in a way they prevent anybody to find out if an email address is good or not sometimes to protect their customer email addresses from harvester tools. 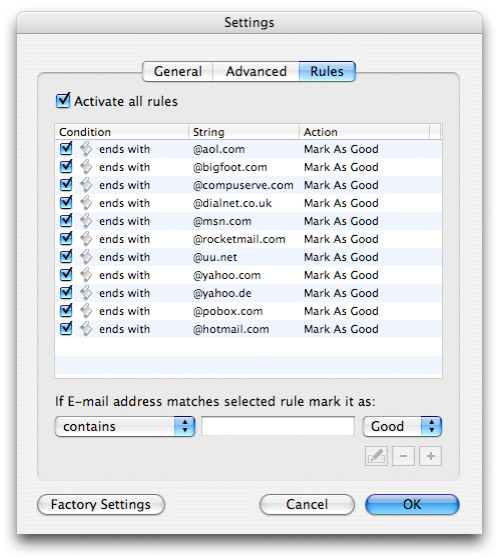 As a workaround eMail Verifier lets you add rules to mark email addresses as 'Good' or as 'Bad'. A default set is included. You can add/edit/remove rules at your convenience. For example rule #1 will auto-mark all AOL addresses as Good by default. No testing will be done on AOL addresses. We simply consider them all as good. Maintain clean mailing lists checking the validity of recipient's e-mails addresses. eMail Verifier can save time and money for businesses who send newsletters to their clients, nonprofit organizations who send bulletins to their members, or any person or business that needs to maintain a clean e-mail contact list. eMail Verifier is your powerful solution for the standard "message delivery error." Email Verifier verifies every e-mail address from a given mailing list, allowing you to determine 80-90% of "dead" email addresses. eMail Verifier works on the same algorithm as ISP mail systems do. Addresses for e-mail are extracted from a Domain Naming Server (DNS) and eMail Verifier tries to connect with SMTP-servers and simulates the sending of a message. It does not send the message though - eMail Verifier disconnects as soon as the mail server informs the program whether the address exists or not. Email Verifier is a very effective piece of software that can verify over 10 e-mails per second . It can verify single e-mails or huge lists. (eMail Verifier is multithreaded, providing high speed verifying).